POST OFFICE, Railway Street: Postmaster, Mr. J. Shanks. SUB-POST OFFICE: Bow Street, Miss Anderson. SAVINGS BANK AND TELEGRAPH OFFICE: Railway Street. FAIR DAYS : Second Monday in month. CLERK OF PETTY SESSIONS Mr. T. J. English. TOWN CLERK; Mr. T. M. Wilson. TOWN SURVEYOR: Mr. S. W. Farrington, B.E. RATE COLLECTOR: Capt. W. E. Coulter, M.C. CLERK OF MARKETS: Mr. Robert McWright. CAPTAIN OF FIRE BRIGADE: Mr. Wm. Megran. MANAGER OF GAS WORKS: Mr. A. S. Brook. STATIONMASTER, G. N. R. : Mr. John Alister. OF BIRTHS, MARRIAGES AND DEATHS: Mr. S. Crail. BOARD OF GUARDIAN-s: meets on alternate Tuesdays at 12 noon. DISTRICT HOSPITAL : Surgeon; Dr. H. S. Murphy. COUNTY ANTRIM INFIRMARY: Surgeon; Dr. Johnston. Christ Church ; Rev. R. H. S. Cooper, M.A. PRESBYTERIAN; Market Square ; Rev. J.J.C. Brakey, B. A.
Sloan Street; Rev. Jas. Morrow, B.A. METHODIST CHURCH: Rev. R. S. Lyons, B.A. ROMAN CATHOLIC CHURCH : Very Rev. Canon O'Boyle, P.P. Ulster Bank ; Thos. Malcomson, manager ; Belfast Bank ; John A. Cook, manager. R.U.C. BARRACKS ; County Inspector Britten, District Inspector Anderson and Head-Constable Goold. THOMSON MEMORIAL HOME FOR INCURABLES; Miss Jones, Lady Superintendent. SCHOOLS : University and Intermediate School (Mr. Hugh Maybin) ; Infant School, Longstone Street (Miss Wilson)National School, Market Square (Mr. J. Fletcher). National School, Seymour Street, (Mr. F. O'Kane). National School, Wallace Avenue, (Mr. J. Boyd). National School, Chapel Hill, (Mr. J. Fitzpatrick). National School, Hilden (Mr. R. M. Forsythe). National School, Largymore, (Mr. J. Forsythe). Friends' School, Boarding and Day, (Mr. C. F. Spencer Smith). Nicholson Memorial School; (Mr. J. Smyth, B.A.). LISBURN GOLF CLUB; Mr. W. E. Coulter, Hon. Secy. LISBURN NEWS Room: Mr. R. Greene, Hon. Secy. PRINCIPAL STREETS: Business; Railway Street, Market Square, Bow Street, Chapel Hill, Bridge Street, Seymour Street, Smithfield, Castle Street, Longstone Street. Residential ; Antrim Road, North Circular Road, Belsize Road, Belfast Road, Dublin Road, Bachelor's Walk, Magheraleave Road. MEDICAL DOCTORS: Dr. Mackenzie, Dr. Johnston, Dr. Campbell, Dr. Peate, Dr. Murphy, Dr. Sinclair, Dr. Kean. PRINCIPAL INDUSTRIES: Manufacture of Linens and Linen Threads, (Three Mills and eight factories) ; Furniture making, (Two factories). It is indeed very difficult to give a short history of any Irish town, without touching on that tragedy of tragedies -Civil War. 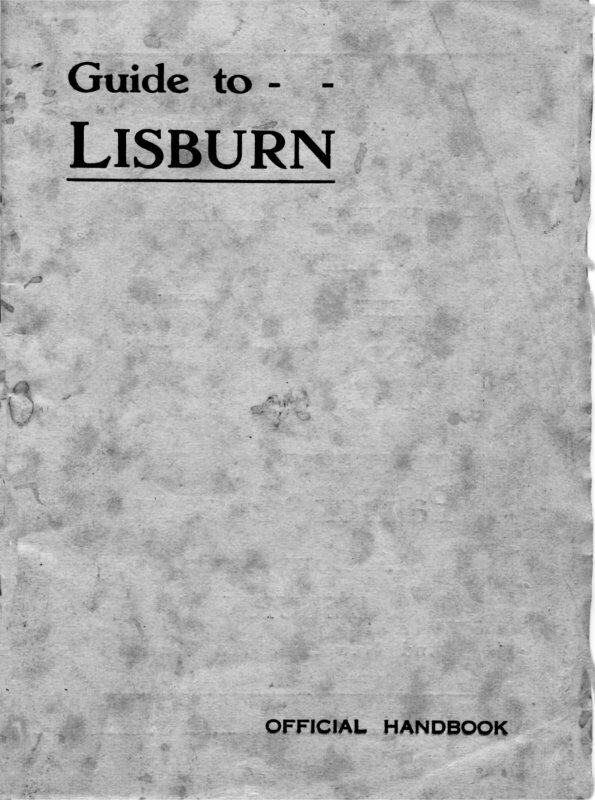 Throughout the ages, Erin has been divided within itself, and while we are not concerned here with political, economic or religious reasons for the continual strife in that isle, still we cannot ignore the fact, unpleasant though it be, and we give in the following pages a brief summary of the development and situation of Lisburn, taking a most neutral stand with regard to the quarrels and subsequent appeals to the law of force. Situated on the river Lagan, the town of Lisburn-at one time known as Lisnagarvagh--is of ancient origin, and before the reign of Queen Elizabeth was but a small village. At one time it was one of the fastnesses of Hugh MacNeil Oge, son of Neil Oge O'Neil, a Prince of Tirowen. The name is derived from Lis-na-garvoch (the fort of the gamester) a circular path on the north side of the Wallace Park. In the neighbourhood several of these may be seen, and historians are agreed that these were surrounded by deep ditches, or moats - and the whole enclosed with strong palisades, a high rampart of earth and wood, well flanked with bulwarks. Three of these may be visited in Ireland-one on the Clogher Hills, Co. Down ; one at Todd's Grove and one on the White Mountains. These were used in order to establish communication between one another in case of attack, by means of beacons being lighted, and in order to fulfil this purpose were placed on a high part of the country ; most certainly they are the remains of strongholds and dwelling places of the Celtic chieftains. These were used up to the year 1600. Previous to 432 when St. Patrick introduced Christianity into Ireland, Druidic was the prevailing religion, and a cromlech--an altar for human sacrifices --can be seen at the Giant's Ring, Ballylesson, Co. Down. Relations between the Government of England and the native Princes of Ulster were very strained during the reign of Queen Elizabeth, at which period the. O'Neills were very powerful and had a large following in the northern province. When. years of warfare had proved fruitless, the Queen resorted to a certain form of diplomacy which did not achieve the desired result. Shane O'Neill, was offered an earldom, and in scorning any such favour from Her Majesty's hand, replied that by blood and birth his rank was far above a peerage. " My ancestors were Kings in Ulster," he added, `they gained their power by the sword, and I shall uphold my rights by the same weapon." When Sir Henry Sidney-the Queen's Irish Deputy attended by an armed bodyguard of mounted soldiers, made his tour of Ulster in the autumn of 1585, visiting the leading Princes there, he was most anxious to make friends with the Captain of Killultagh then holding great sway and haying an influential position of that powerful Sept ; his domains covered a large territory and he was lord of three castles, all being encompassed by forts of great strength. One of these built on a mound above the River Lagan, close to Lisnagarvey, commanded the entrance from the County Down side, and was in a fine position to thus act as a refuge from all invasions coming from that part. Sir Henry, however, for some reason or other did nor act in a manner, likely to thaw the Captain of Killultagh, and waited outside the rampart, seated on his horse. One of his officers then called on the Captain announcing his --the Irish Lord-Deputy--arrival and that he desired to speak to the Captain. The Captain, however, viewed the advent of the English as invaders of his country, and the conduct of Sir Henry merely served to inflame his anger. He scorned the idea of waiting on the Deputy and sent back the message " If the English Deputy wishes to pay his respects to me, I will be happy to see him inside these walls." This in turn so vexed his Lordship that in his report to the English Cabinet he says, " I came to Killiltagh, which I found ryche and plentyfulle after ye manner of those countryes, but ye Captain was proud and insolent; he would not leave his castle to see me, nor had I apt reason to vysyte him as I would. He shall be paid for this before long. I will not remain long in his debt." This treatment to her deputy so enraged Queen Elizabeth that orders were given to these commanders that neither men nor money counted, so long as the power of the O'Neills and their friends was smashed. So commenced the strife, until in 1587, Brian McArt O'Neill and his father the Captain of Hillultagh, after many overtures and full pardon was promised, accepted the English Rule. In her Majesty's name, Sir John Penot accepted the pledge, but on hearing that a kinsman of theirs had gathered an army against the English, the Captain and his sons, joined that expedition and cancelled their previous promise. Once again there was strife, and battle, and death; once again mothers mourned for their sons, and wives for their husbands. In the year 1602, Lord Mountjoy was commanding the English forces, and his troops took possession of that stronghold of the O'Neills, the Fort of Ennisloghlin. It was bravely defended, and after enduring the most gruesome horror of devouring their fellow defenders, the army surrendered, and O'Neill submitted to the Queen's commander. A full pardon was granted, and with slight reservations, O'Neill was granted a new patent for his lands. The news of the death of Queen Elizabeth was made known at the first Council in Dublin that O'Neill attended after his surrender, and when he was received according to his rank. On being informed of the death he burst into tears, on the plea that " he was unable to contain his grief at the loss of a mistress whose moderation and clemency had at length caused him to regard as a generous benefactress." There were many who disbelieved him, thinking he was bitterly accusing himself, for his lack of courage in not holding out for a few more days when he might have commanded better terms. The right reason we may never know, but most certainly the power of the O'Neills, Earls of Tirowen, Captains of Killultagh and the Lords of Lisnagarvagh, vanished in the company of the life of Queen Elizabeth. The lands of the O'Neills however were by letters patent sold to Sir James Hamilton in 1604, who transferred them by the same means to Sir Fulke Conway of Conway Castle, Wales, in 1609. Under his ownership the town flourished and Castle Street, Bow Street, and Budge Street in their present form laid down. Sir Fulke encouraged both English and Welsh to settle there, and many took up their residence. The Cathedral was opened for Divine Service in 1623 during James the First's reign, when it was known as the Church of St. Thomas, then Christ Church in 1662, and it was during the reign of Charles the Second that it was raised to the Dignity of a Cathedral for the diocese of Down and Connor. Lord Conway in 1627 built a castle on a hill which commands a lovely view of the valley of Lagan, a portion of which that formed the entrance-may still be seen. An author writes regarding this ;-- " From Belfast to Linsley Garvin is but seven miles and appears a paradise compared with any part of Scotland. Linsley Garvin is well seated but neither the towne nor the country there about is well planted, being almost woods and moors until you come to Dromnore. The towne belongs to my Lord Conway, who hath there a hainsome Castle, but far short of Lord Chichester's houses. Lord Conway's garden and orchard are planted on the side of the hill on which his house is situated, at the bottom of which runneth a pleasant river, the Lagan, which abounds with salmon." In the year 1641, when the Irish rose in rebellion against the English Lisburn was beseiged by the nationalists on November 28th. 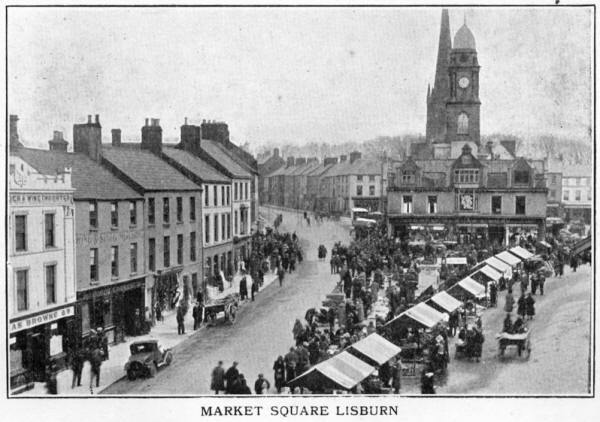 Owing, no doubt, to the fact that a great many of the inhabitants were of English and Welsh descent, the town of Lisburn was always most loyal to the English "throne. The records of the Cathedral-then a Chapel of Ease for English troops,-contain the following account of that time.
" Sir Phelim O'Neill and Sir Conn Magenis, the insurgent Generals then in Ulster, and Major General Plunkett, having enlisted and drawn together out of the Counties of Armagh, Tyrone, Antrim and Down, eight or ten thousand men, which were formed into eight regiments and a troop of horse and two field pieces did rendezvous on the 27th November 1641 at a house of Sir George Rawdon, at Brookhill, three miles from Lisburn, in which town they knew there was a garrison of five companies and Lord Conway's troop of horse. They made their attack in three divisions, at the end of Castle Street, Bow Street and Bridge Street. More than two hundred of the insurgents were slain in Bridge Street and three hundred in Castle Street, and in the meadows behind the houses, whereby they were so much discouraged that for almost two hours their officers could not get any more parties to adventure a second assault upon us, but in the main space, they entertained us with continued fire from their body and their field-pieces till about one o'clock, when fresh parties were issued out, and beaten back as before, which they supplied with others till dark, when they fired the town, which was in a few hours burned to ashes. The slain of the enemy, were found to be more than thrice the number of those who fought against them. Their two Generals quit their station; their two field pieces were thrown into the river or in some moss pit and could never be found, and in their retreat or rather flight, they fired Brookhill House and the Lord Conway Library in it, and other goods to the value of five thousand pounds. All our horse, which did most execution, were not above 120, viz :- Lord Conway's troop, and a squadron of Lord Grandisons troop. We got about fifty of. their colours and drums. And they were so enraged at this defeat that they murdered many hundreds of Protestants whom they had kept prisoners in the counties of Armagh, Tyrone, etc." A piper at this siege had his head blown off, and rolled down the hill, which is now known as Piper Hill. Until Cromwell with his forces destroyed Ireland's independence as a separate nation, that isle was the scene of much bloodshed and battle. Royalist, Parliamentarian, and the native Irish each and all, rose as an armed force to secure the rule of Ireland-then came Cromwell and Ireland was conquered. During this horrible trial, which Ireland underwent, Lisburn was the .scene of many battles, and time, with her ever patient hand, has smoothed the scars and healed the wounds. 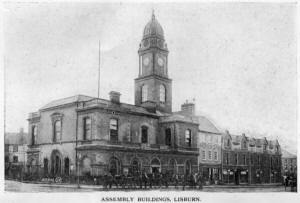 But let us turn to more pleasant aspects of the growth development and history of Lisburn. Stratford-on-Avon will for ever be linked with the name of Shakespeare, and the town of Lisburn may well be said to be the Stratford-on Avon to that famous Bishop-Author, Jeremy Taylor. Born in 1613 at that seat of learning, Cambridge, he attended the University there, and took holy orders, after which the famous Archbishop Laud appointed him one, of his chaplains. Thus early he was thrown on the Royalist side, and Charles the First and he formed a very close friendship. At the close of the Civil War in England, when the King's cause was shattered, Taylor received from his King, a watch as a momento. Lord Carberry of Wales offered Taylor a home during the period which elapsed between the War and the Restoration. It was in Wales that we find Taylor produced most of his works, but in 1657 he was imprisoned in the Tower of London. Released in 1658, Lord Conway conveyed him to Lisburn, where he held a lectureship. influence with Charles the Second, and Taylor was appointed Bishop of Down and Connor, to which was added the administration of the See of Dromore. The Bishop had been in residence at Portmore, and at Magheraleave, Lord Conway fitted up a most charming house for his comfort. Here it was that the prelate wrote some of his later works. The. cottage and the study still can be seen, and here the visitor may share in the beauty, peace and rural surroundings, which the late Bishop delighted in. Alas! the evening of his days were somewhat disturbed by the subject of conformity, and his pursuits in literature were checked. Contracting a fever while visiting, a stricken parishioner he passed to his rest on 13th August, 1667, and was interred in Dromore Cathedral's chancel, Bishop Mant erected in his memory a marble slab with a suitable inscription in Lisburn Cathedral. Lisburn. may well be proud of her associations with the author of such gems of literature as " The Liberty of Prophesying," Holy Living," " Holy Dying," and " The Great Exemplar." The town in common with the rest of Great Britain was affected by the political events which took place from the restoration of Charles the Second in 1660, till the death of William the Third (1702.) Cromwell never really subdued the inhabitants, who refused willing obedience to the Protector, and as a mark of esteem to his father and himself, King Charles on his restoration gave the town the right to elect two representatives to the Irish Parliament and as already stated raised the Church to the dignity of a Cathedral. In 1685, when Louis the Fourteenth of France revoked the Act of Toleration, the Protestants or Hugenots, were forced to flee France, and make their abode in foreign lands. 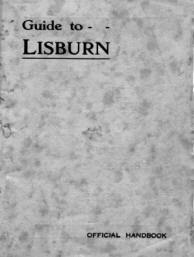 Many in their flight settled in Ireland, of whom the majority made Lisburn and the neighbourhood their home. 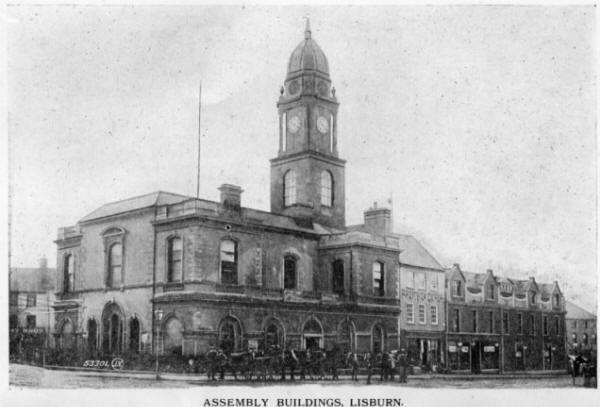 In their native land of France, some of the refugees had followed the trade of linen or silk manufacture, and when on reaching the shores of Ireland, they naturally continued in following their particular bent, thus bringing a new idea of this industry into their adopted land, for Lisburn had already found employment in the cultivation of flax and manufacture of linen, although little or no progress had been made in these arts. The government encouraged the industry by gifting money for the erection of suitable factories for this manufacture. Once more we must make reference to that demon which has always been uppermost in Ireland ; that demon which has torn Ireland asunder time and again ; set house against house ; father against son ; the fearsome, horrible and ruthless demon-War. James II. assumed the throne in February 1685, which he held but for four years, during which, war was playing havoc in Ireland. In command of 10,000 men, the Duke of Schomberg landed at Groomsport, made Lisburn his headquarters, where for six months he resided in the house previously occupied by Bishop Jeromy Taylor. The dawn of a new era was at hand. The news was spread by means of bonfires on the mountains of Down and Antrim, on the 14th of June, 1690, that King William together with his bodyguard and troops had landed at Carrickfergus, from whence he proceeded to Belfast, leaving there on the 19th June on his way to Dundalk. His Majesty stayed a few days in Lisburn, during which time, his sympathy was evoked on behalf of the Church and he increased the amount of the Regium Donum to twelve hundred pounds, and immediately wrote an order for the first year's annuity. Once the revolution was over and peace for a time prevailed, the people of Lisubrn applied their minds to the manufacture of linen, and under the Crommelins, Delacherois, Richardsons, Barbours and the Coulsons, such progress was made and a high degree of excellence was reached. Lisburn was destroyed by fire in 1707, and all that now remains of the ancient city is the surrounding wall and gateway; on the top of its highest stone is engraved the date 1677. One of the first houses to be erected after this calamity, and which is now in the hands of Messrs. Duncan and Sons, Ltd., has a stone in the front which bears the following inscription. To give to them a second stroke. The landlord living at that time, may think upon the builder's case. At the beginning of the 19th century, the weavers of Lisburn when cutting the ends of their warp yarn used a most awkward instrument called a " shears," and a Scotch cutler, one Robert Knox, was instrumental in improving these, to such an extent that his fame spread throughout the Kingdom, and before his death he was unable to meet the demand. Mounted shuttles for use in the linen, trade bearing the name of " Kelly " were recognised as the best of their kind, were the invention of a native of Lisburn, of the name on the shuttle. Year after year this industry of Lisburn has grown, and it would serve no purpose here to detail the struggle the steam pioneers met when they first introduced mechanical power in their works. Nor will we enter into any details of more modern history of Ireland, with its terrible repitition of strife and bloodshed, but in common with all mankind we do hope that Ireland will now throw off that hand which must strangle any country's industry, and ere long she will once more take the place in the history of the world, which she once so proudly held, when she was famed throughout Europe as a seat of learning, and the garden of the Church. ROBERT STEWART & SONS, LIMITED. Close to the Railway Station at Lisburn, the Flag Spinning Mills, and Thread Manufacturing Works of ROBERT STEWART & Sons, LIMITED, are seen from the trains of the Great Northern Railway. The works are very conveniently and pleasantly situated within the town limits, and with workers' houses etc., cover about ten statute acres. 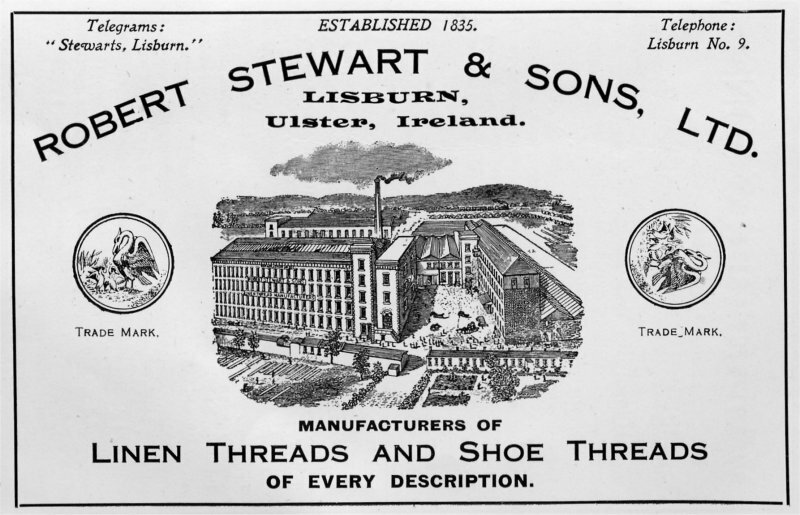 The history of Robert Stewart & Sons, Limited, as Flag Spinners, Linen and Shoe Thread Manufacturers, commenced in the year 1835. In that year the l late Robert Stewart, senior, of Lisburn, began twisting thread here by hand, and in the course of a few years afterwards he had about 3,000 spindles at work spinning the yarn used in the manufacture of the thread. In the year 1845, Mr. Stewart took into partnership his sons Robert and James Andrew, from which date the firm traded under the style of Robert Stewart & Sons. Robert Stewart, senior, died in the year 1858, but the business was actively continued by the brothers until the year 1882, when Robert Stewart, junior, died, leaving his brother James Andrew as the sole proprietor of the concern. Many extensions had been carried out in the life-time of Robert Stewart, junior, and the continued growth of the trade of the firm rendered it necessary a few years after his death for the surviving partner to erect an entire new spinning mill, which was completed in the year 1889. This is a handsome structure, built on the most modern designs, and fitted throughout with the most approved sanitary arrangements. The comfort of the workers is ensured by the installation of the most efficient ventilating arrangements. The works are lighted throughout by electricity, and employ almost 600 hands, a large proportion of which are females. Tailors' threads and shoemakers' threads, both for hand and machine sewing, are specialities of this firm. In the year 1899 the firm became a Limited Liability Company. Fame has been brought to Ulster by many of her productions, and not least by her Linen thread. 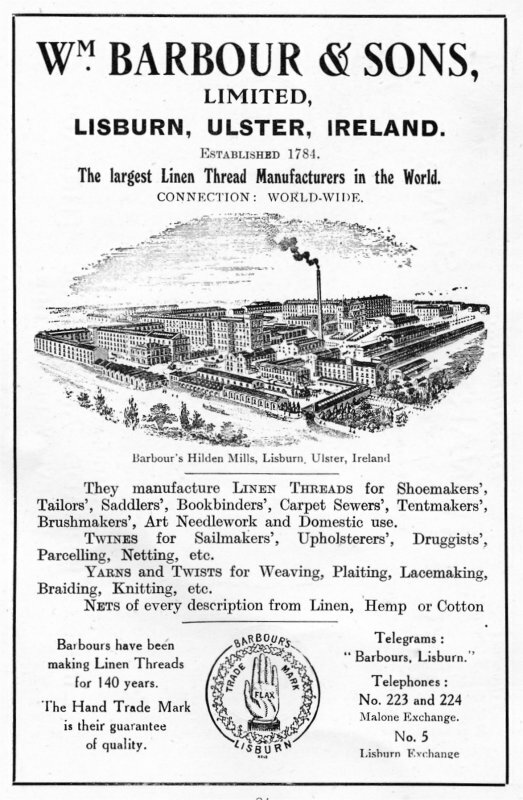 This industry, introduced into Ireland in 1784 by Mr. John Barbour, a native of Paisley, has now grown to large proportions, but it is gratifying that throughout the hundred and forty years that have elapsed since Linen thread making was established, one of the principal firms in the industry, that of Messrs. Wm. Barbour & Sons, Ltd., Lisburn, has maintained its family association with the founder. 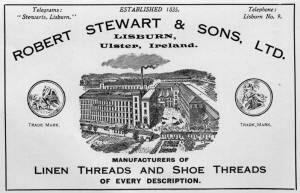 The history of this firm is, in fact, largely the history of the Linen thread industry in Ulster. Small mills were erected by Mr. John Barbour at the Plantation, Lisburn, and young women of the district were trained in the art of making thread. In 1823, Mr. John Barbour was succeeded by his two sons, John and William. Dissolving partnership with his brother, William Barbour removed to the adjacent village of Hilden and erected works on a site adjoining the river Lagan. Twelve years later he purchased the original business at the Plantation and removed the Machinery to Hilden. Here, with great energy, he developed the business, extending the works from time to time as demand increased for his products. When the business subsequently passed to his four sons, they continued the progressive policy, adding to the works and maintaining the firm's high reputation. Becoming a Limited Liability Company in 1883, Messrs. Wm. Barbour & Sons, Ltd., considerably widened its scope of operations when, in 1898, it joined with other Irish, Scotch and English linen thread manufacturing firms, forming The Linen 'Thread Co. Ltd. Mr. J. Milne Barbour, M.P., D.L., a descendant of the founder is a director of Wm. 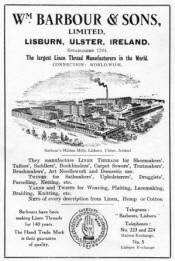 Barbour & Sons, Ltd., also Chairman and Managing Director of the Linen Thread Co., Ltd., of Glasgow. He is rendering invaluable assistance in shaping the destiny of Ulster at this momentous stage of her existence, as a leading member of the Northern Government, as well as taking a prominent part in the development of a. number of the largest Industrial and Commercial concerns in the Province. In order to retain their markets in the United States, Messrs. Barbour's erected large works at Paterson, New Jersey, in 1883. Their overseas branches, in conjunction with the home factories, give employment to about 5,000 operatives, thereby entitling the firm to the claim of being the largest Linen thread manufacturers in the world. A network of agencies has familiarised every user of linen threads, twines, etc., with the productions carrying the device of the " Red Hand " with the word " Flax " across the open palm, which is the Firm's Trade Mark. Concern for the welfare of their employees is characteristic of the firm. Hilden is a model village built by the company for their operatives, where an admirable primary school has been erected; and recently there have been provided Hard Tennis Courts of the most modern type, a Bowling Green, as well as fully equipped pavilions for the use and comfort of the members. Everything, in fact, is done to promote the intellectual and physical welfare of the firm's employees.